Some of us are die-hard quilters. Others are more "quilt appreciators". Some here are mildly interested while others spend hours every day quilting. I know that there are various "types" or "styles" of quilting designs. For example - applique, scrappy quilts, 'modern' quilts, "classic" or "traditional" quilts, charity quilts, miniature quilts, and everything in between as well. For those of you are reading this - I started out quilting by doing mostly charity quilting. My first taste of quilting was when I made some 9 patches from ugly fabrics. I then discovered how fun it was to make charity quilts from fun fabrics. Charity quilters love to make simple but fun things. I think our mantra is that we will use whatever we have - and do the best we can. Some charity quilters make things for places like women's/children's shelters and the victims of fires and other natural disasters. Some focus on making “ugly quilts” for homeless shelters and literally use “whatever”. 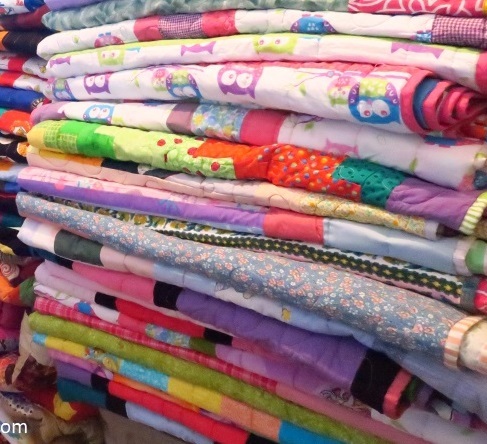 Other charities are more picky about the materials that quilts are made from and have lists of required fabric types, sizes, and styles of quilts. I've got all my charity quilts from 2017 in one post. You can see what I'm talking about when I make charity quilts. "Sheet of Stamps" is a controlled scrappy quilt. Since I made so many charity quilts, I began to have lots and lots of scraps - small pieces leftover after I trimmed things down. This began my adventure into scrappy quilting. I'm a scrappy quilter mostly by default - as I have lots of scraps. Scrappy quilts involve using lots of different colors and styles in one quilt. They vary from completely scrappy to a controlled scrappy where the colors are carefully placed. I you think you don't like quilts, it could be that it is the busy look of a typical scrap quilt that you don't like. I made one a few years back and my daughter called it "scrap vomit" (and it was neither a compliment or a joke) - and she told me it was this type of quilt that the younger generation doesn't care for – actually she said something stronger than that – she said “This is why young people don’t like quilts." I've not gone here much. Applique is when you take a piece of fabric and sew it on top of a background piece of fabric to create a picture of some sort. You can make modern or classic applique. You can sew it on by hand or by machine. 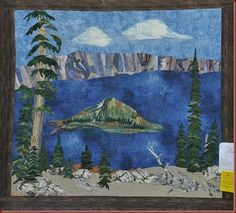 Some of the first quilts I saw that made me go "Wow" were appliqued quilts at the Alaska State Fair that I saw in 2003. Landscape applique quilt I took off of pinterest. These are quilts that focus primarily on embroidered blocks. Some are hand done but these days, most are done with an embroidery machine. I’ve only made a few of these, but I really do like them. 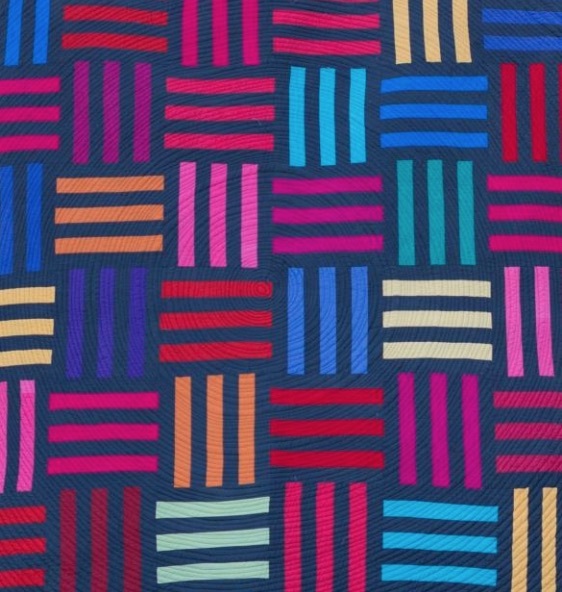 I think of a type of quilt where you make 20+ of the same blocks. It appears that we are seeing fewer of these than previously since the onslaught of precuts which automatically give a scrappy look. But I admire the tenacity of someone who will make 50-100 identical blocks to make his/her quilt. I made "Glam" and talked about it here in this blog post. These are distinctive – usually you either love them or hate them. I’ve not ventured into this sphere of quilting yet. Precision and perfection are the name of the game here. These people work with 1” pieces – for a finished size of .5”. Can you even imagine? Nah. I can’t either. Mod Rails has a modern look to it with its simple design, circular quilting and bold colors. As to their definition – that’s tough. The definition has been bandied around quite a bit. In general, however, they seem to use bold design lines, the use of solids, simple piecing, bright colors, lots of white and empty space for some drop dead quilting. The definition seems somewhat fluid, however, and you’d have to go to some of their sites to find out exactly how the current modern quilter defines a modern quilt. Sometimes it is as simple as taking a traditional design and changing it somewhat. Because the definition has caused more than one heated discussion and possible loss of friendship, I’d rather not make you think I’m an apologist for modern quilting. I’m not. I am not very good at improvisational quilting, but I can take a classic quilt pattern and do a twist on it. The closest I've gotten to this is Mod Rails. Here they take a piece of fabric, and sandwich it and make a piece of art with only the quilting. There is no piecing involved, except possibly to piece the solid pieces of fabric together. Usually it seems these are made from white or cream fabric, but not only. I wanted this post to give those of you who may be new to quilting a cursory introduction to quilting. Quilting isn’t only Sunbonnet Sue applique that your grandma took 1-2 years to make. You can literally make quick and easy quilts too. So...what type of quilt do you prefer? If you prefer something I've not mentioned, feel free to comment in the comments section. And so…if you need something for your current project, don’t forget to check out what we have for you over in the store! Keep an eye out for new things. We’re getting things processed and ready for you!